Hi, it's Kathi today to host the blog. 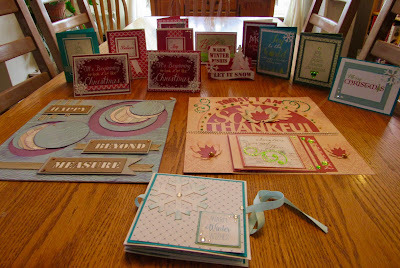 Thanks for joining me today, I took the contents of the November Club Q and wanted to share my creations. The Christmas cards I used the quotes to create the front of the cards. Three of the cards have duplicate quotes, they are designed somewhat different. Layout 1 (on the left) I used the circles as photo mats, added "Happy Beyond Measure" backed with white cardstock, then matted on the patterned paper. I used the light weight chipboard backed by the coordinating patterned paper. Layout 2 (on the right) I used the cut out "Today I Am So Thankful" sentiment as my focal point, cutting leaves to add to the center of the semi-circle. I then added green bling and green and orange dots around the semicircle. I added a cascading waterfall photo mat under the word thankful. Inside of mini album I used a quote from the kit, die cut winter sleigh filled with presents.